Fall has hit here in our little town. I can see the mountains from my craft room window and the trees are gorgeous!!! I love fall. Unfortunately, here in Utah it seems likes fall lasts about one week, and then the snow hits and we’re freezing our patootskies off. OK, that may be a bit of an exaggeration, but fall is seriously short around here. And I’ve got lots of spray painting to do before the snow flies. I had a few minutes of free time today, so I decided I’d better get cranking. 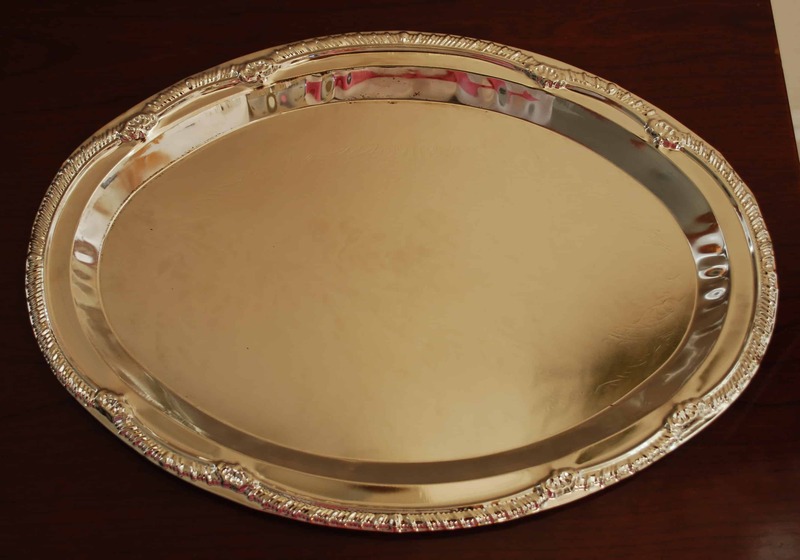 Start with a ceramic or metal tray. I used a metal tray from the dollar store. Spray paint it with a few coats of antique white spray paint . Let it dry completely, and you are ready to start antiquing. I used craft paint that I watered down. It’s cheap, and I already had it on hand. 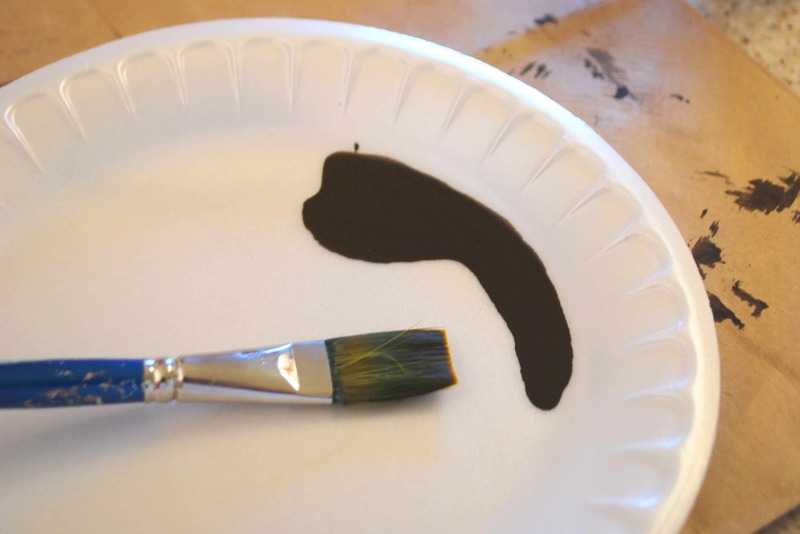 I wanted my finish rather dark, so I mixed brown and black paint together till I got the shade I wanted. It doesn’t take a lot, just a few little squirts. I mixed mine in a paper cup with a popsicle stick. Then I added water till the paint was thin, like ink. 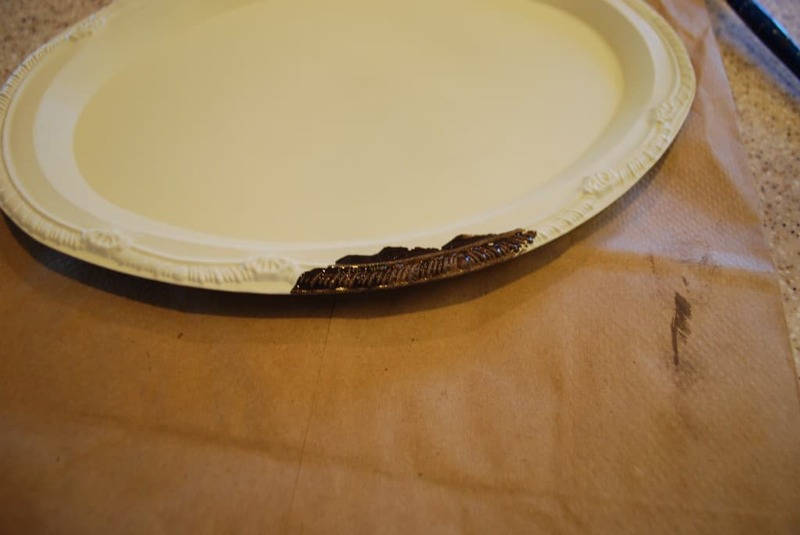 I poured some on a paper plate just so you could see how thin it is. See how it runs all over like ink? That’s how you want it. Now it’s time to do some antiquing. I find that it works best to work in small sections at a time. 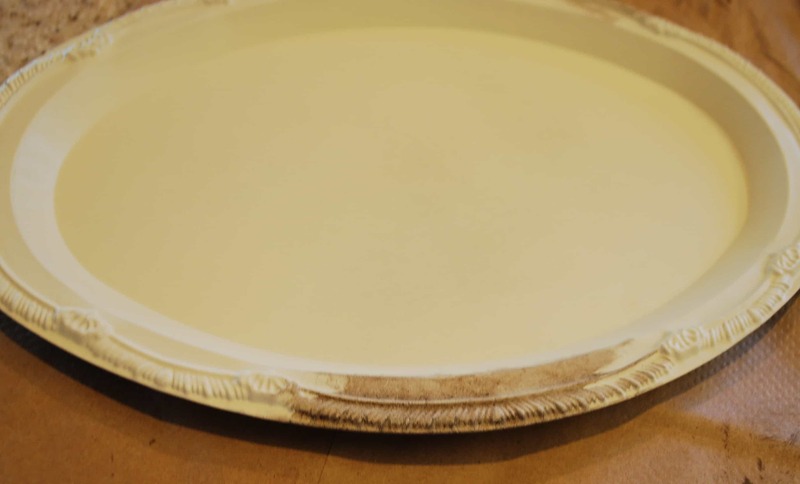 Use your paintbrush to add some of your watered down paint to the edge of the plaque. 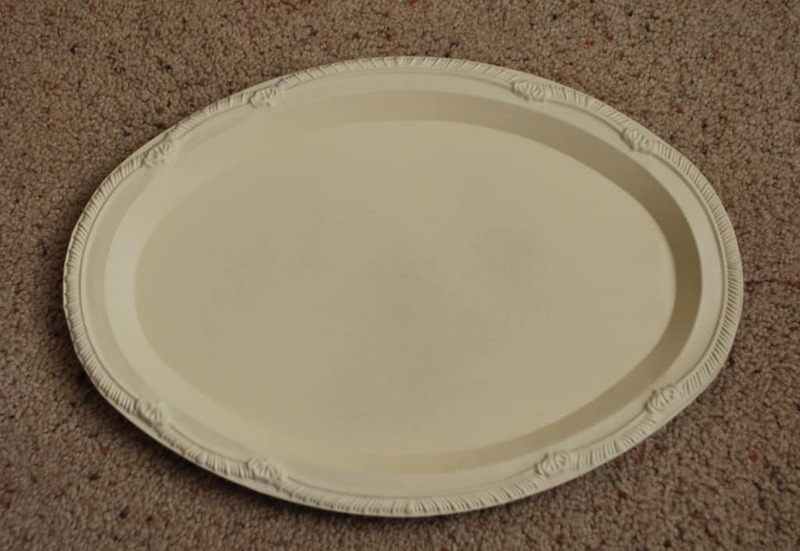 Continue adding and wiping off the paint till the whole tray is antiqued. Now you can add some vinyl lettering, or anything else you’d like. Thanks for the idea! I needed the new idea. You can only make so many wreaths. LOL. Great for the next trip to the DT. Thanks for sharing. Hey everyone there’s a new easier way to put wording on these trays. It’s called Chalk Couture. Email me if you want more information. Tell me about chalk couture please. Where do you find the vinyl quotes? I cut mine myself with my Silhouette machine, but you can find them in most craft stores, or on Etsy or even Amazon. 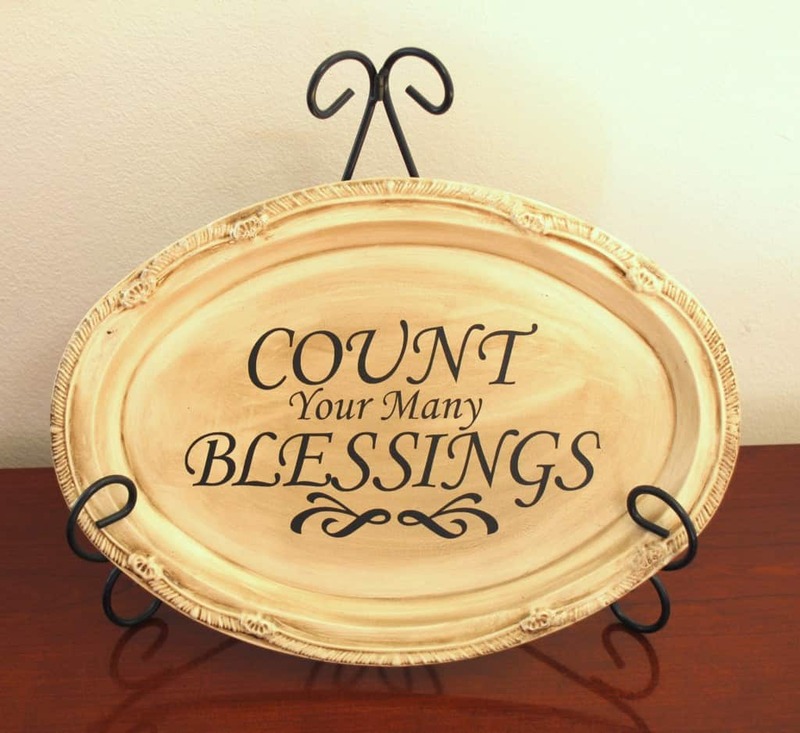 I saw these trays at Dollar Tree!! I wanted to do something with them and this is perfect!! I don’t have a Cricut to make vinyl letters. Did someone say Dollar Tree has the rub on things?! would I be able to use mod podge to put a personal twist on this? I have printed out a last name and watched a tutorial on how to use mod podge on wood. Do you think it would work on this? Yes. You can pretty much mod podge anything. Good luck. A great idea. And for those of us without fancy machines, and who really want to keep it cheap, pick up one of those rub-on saying thingy’s from DT as well. There are all kinds of them available. 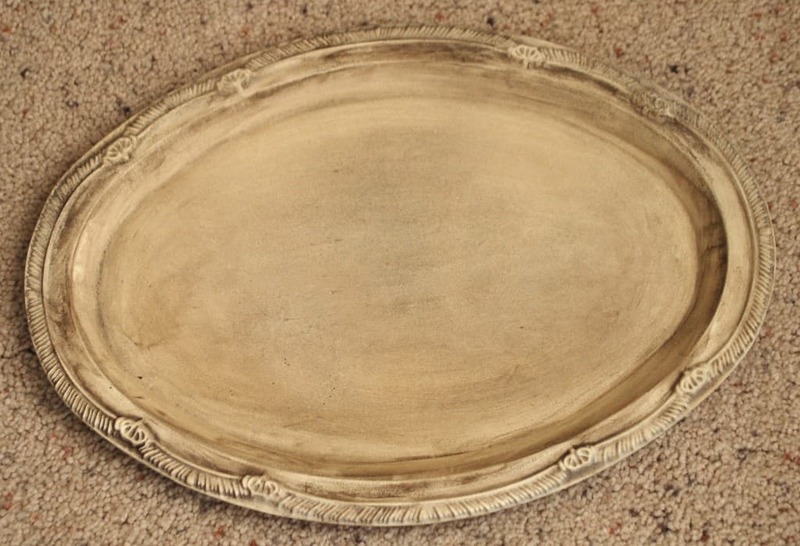 I’m a beginner DIYer and need to ask you a question about this tray. What Cricut cartridge did you use for the vinyl lettering? I’d appreciate, really appreciate, if you could assist me with this. Wow! What a clever idea. Inexpensive but still looks like a million bucks. Thanks! I’m visiting from Thrifty Decor Chick’s Before and After Party. Love this, Kara! I’m printing you out! 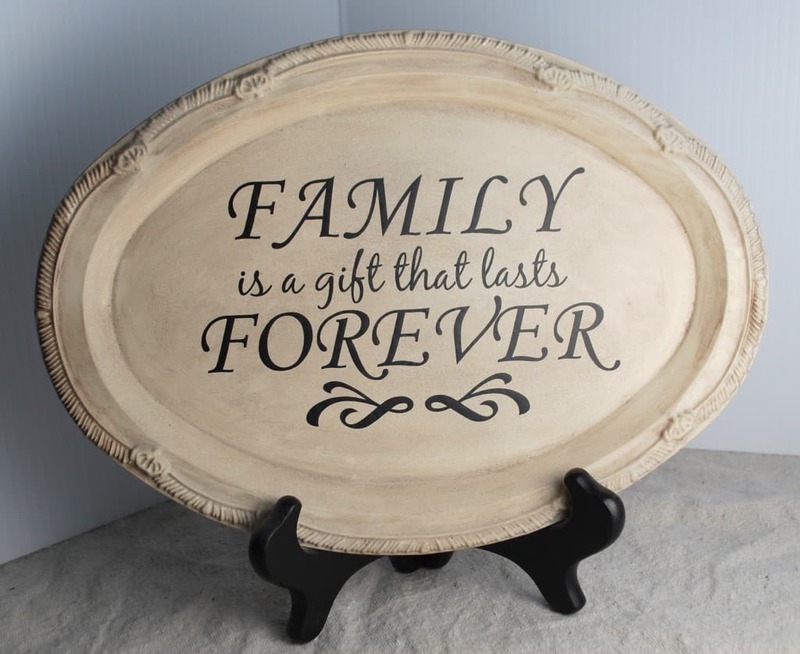 : ) I bought a few of those trays when I did my daughter’s baby shower in June and I glued oval wood pieces to the centers, spray painted chalkboard black. We did an Alice in Wonderland tea party theme so I wrote on them “Eat Me” and “Drink Me”. I’ve just pulled them out again and think I will write Halloween words on them. Love your idea for these trays, though. Congrats on your feature at Cheri’s! Okay, I saw those very trays at my dollar store and thought, hey, those would make a really cool craft, but what I don’t know. Thanks for the inspiration! I love your finished result. What a great idea. And great tutorial on glazing. What a great idea … I am going to try it! Thank you for sharing – just lovely. Oh thank you for this!!! I have an old silver platter from my Grandparents that I want to redo. Plus, I have all the tools needed, woohoo!!!! Thanks for the great idea. I know what I’ll be looking for on my next trip to the dollar store! I love this idea! I’m thinking Christmas gifts for the grandparents! I’ll have to check out your vinyl lettering! Love this idea!! It looks great, and you’d never guess it was from the dollar store! Thank you for sharing your tutorial!! Wow, I woulda never knew that was a dollar store tray once you painted it! Nice job. Im a new follower, check mine out sometime! I agree whole-heartedly with the messages on your plates. Nice! I have not tried antiquing yet but this may be a good one to start with. Thanks for sharing! I love this idea. Keeping it in mind for the new house.